A Hand Painted Porcelain Dutch Girl Powder Puff Half Doll dressed in a pink pleated satiny striped skirt with gold ruffles. She is holding in her two hands, a little white cup and saucer. Her skirt has no holes, tears or stains. 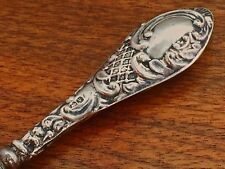 The silver handle is decorated with rococo swirls and trelliswork, and bears English hallmarks for Birmingham 1920 to both sides. Up for sale is a gorgeous, sterling silver set of four ladies vanity items made by fine American silver maker, Foster & Bailey. 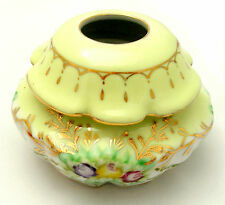 The handles are beautifully designed featuring a lady gazing at birds surrounded by flowers. Included in the lot are two shoe horns, one nail file and another nail file/cuticle tool combo. The largest item measures 8 1/4” long and the smallest measures 5 1/2” long. The handles are in overall very good condition with no splits or repairs. The handles is clearly marked "Sterling F&B". This is a gorgeous, original Art Nouveau era set! Thank you very much for looking!! Please send payment in PayPal please. International bidders are welcome. The mirror is adjustable, it swivels forward and back. If needed in double box. They are described the best way I can. English Gents Alligator Traveling Case & Grooming Set. Manufactured by Mapping & Webb. FREE Trial! This is made in Sterling Silver. This set consists of 9 pieces. The case stays together nicely, but there is a small tear in the back, not noticeable. Antique Art Deco DM CO. Birmingham STERLING Faceted Glass Jar. Art Deco DM CO. 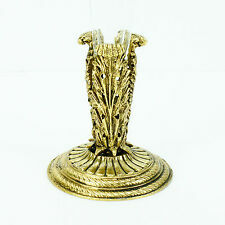 It is a truly lovely piece which would grace any bedroom dressing table. A beautiful vintage Apollo vanity hand mirror with pink guilloche back. Ornate gold gilt handle and details on the back. Mirror is bevelled and clear. There is some surface scratching, tarnish and dust, some of the gilt is worn. Aproximate measurements are 13"l by 4.5"w. Stamped APOLLO on the handle. Manicure tool (Length): 5in (12.8cm). ofBirmingham, England in1915. What an excitingaddition to your collection, with its original fitted box! - Nail File (Length): 4 1/2in (11.4cm). Shreve & Co., San Francisco, Sterling. This isn't a garage sale. Art Deco Vanity Set. 21 (Twenty One) Piece. It will be sold as a set with ALL 21 pieces the two other little pieces in another pattern. One piece appears to be missing, 3 containers one brush. All three pieces are marked. Estate Sale Find. If in bubble or plastic wrap, the wrap must be sealed as received. A nice little table top piece. The colors on this madnificent jar is a sight to behold. so much gold gilt is amazing. on the black borders are stylied gold florals. the gold gilt with tiny beading is around the lid and bottom. All in good used condition. May have slight wear from use. All sold as is. Box #1 approx. 5.25" x 2.75" x 3.40". Box #2 approx. 6.40" x 2" x 6.25". Box #3 approx. Beautiful Hand Chased & Repousse Winged Cherub Design w/ Foliate scroll accents. Hallmarked for Henry Matthews. Weight 7.8toz. Condition: Very Good Condition. Light scratches and light oxidation to the silver. Such a Lovely Antique Hand-Painted Porcelain Bavaria Signed 2-Handled Covered Vanity Trinket Box Jar!Painted with Pretty Pink Roses and Stamped on Bottom,Bavaria,#70,Signed Pierre,it is in Great Vintage Condition,with No chips or cracks and it measures 33/4"tall x 6"wide handle to handle x 31/4"wide across open top x 43/4"wide across bottom!. After WWI, the firm shifted emphasis from silver products to production of modern jewelry. Tested & still works! Cotton covered light green cord is still in good condition! 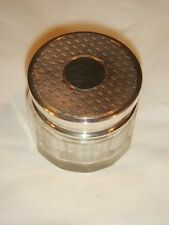 There is surface scratching and wear to the bottom of the jar. The Sterling silver mounts are secure. The convex mirror on the exterior has silvering loss. The underside mirror is cracked. There is tarnish present on the silver mounts. , THIS UNIQUE RARITY IS A WALL HUNG, FOLDING GEISHA MIRROR WITH A SMALL TOWEL RACK, IT WAS BROUGHT BACK BY A G.I. THE ONLY PROBLEM I SEE, THE TOWEL RACK WAS MOUNTED WITH TINY BRAD NAILS THOSE WERE REPLACED WITH A LARGE HEAD TACK TYPE NAIL, ONE OF THOSE IS MISSING, REALLY NOT A PROBLEM, EASY FIX. My hair receiver is unusual. the coralene pattern is made to look like ocean coral. at least the lid is so decorated. the round box stands. the top is hinged and has a double brass ring with the original closure & hinge. It is in the form of a simple box, gilded on the inside, with a hinged lid and a rectangular hole in the base to take a toothbrush handle. A collector's piece! Length x Width x Height: 2 1/2 x 7/8 x 5/8in (6.3 x 2.3 x 1.5cm). We cannot fix a problem we do not know about. or pick up from. Columbia, in. Brazil and. Tanzania, in. New Guinea, he has organized and/or participated in photographic expeditions in. In addition to several years in. A Lady's Maid assisting a young woman in tying her corset. A young woman reaching for her hair brush on her dressing table. Mirror : Painting of a young woman tying her lace-up ballet-style dress shoe. Vintage 5 piece Sterling silver bead detail vanity set with cut crystal jars by Wilcox. The set consists of the following: hand mirror (approx. 9 3/8" long by 5 1/2" diameter), natural bristle brush (approx. 8 7/8" long by 2 3/4" across), jar with open lid (approx. 4 1/8" in diameter by 2 7/8" high), covered jar (approx. 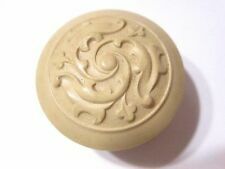 3 1/2" in diameter by 3 1/2" high), down feather powder puff (approx. 3 1/4" in diameter by 2" high). The mirror has some scratches and digs, and two dents along edge. There is also wear to the silvering on the mirror edge. The brush has some scratches and dings, and a dent on the underside of the handle. Some bristles are missing and the wooden backing is exposed. The open lid jar has some fleabites on the interior edge and in a few other spots on the crystal. The mirror stands 1 foot high (30.8 cm) on back easel, fabulously decorated with chased foliage scroll and winged lion-like beasts in marvellous details. The interior mirror has black velvet backing and is removable. WIDTH: 3", PROJECTION FROM MOUNTING SURFACE: 3-1/2". HEIGHT, HOLDER ONLY: 1-3/4", TOTAL HEIGHT with BRACKET: 2-3/4". WALL MOUNTED TYPE, VERY NICE HARD TO FIND ITEM! The Woman I believe is cast iron or spelter with composite face and chest. This dish is in Near Mint Condition. The white spots on the dish inside of lid is light reflection that makes it look like the white rim is chipped. Other spots in the photos are just from light. I don't know who made this but it is stunning.This dish and lid are pretty large. 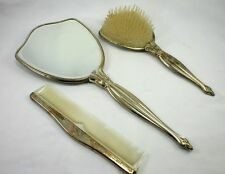 Sterling Silver Vanity Set, c1920 Set Includes Nail file, boot hook, nail buffer w/ tray, & Pin tray. Charming hand chased Foliate Design along trim. Hallmarked for McChesney Co. & marked Sterling. Exquisite.... finely detailed .....Antique Picture Frames. A matched set of two. See pictures for tape measurements. Features French Metal Bows on the top. Layered look ....with lots of detail. Both frames have glass fronts even over the black. The frames have loops on the back from hanging....ready to hang. Not marked by any maker...very French looking I find no damage to the frames. The prints look very good. These are antique frames and they have marvelous dark patina...... Beautiful set.As with all of my items, this item is FINAL SALE, AS IS, and is NON-RETURNABLE, NON-EXCHANGEABLE, and NON-REFUNDABLE. Heavily Enameled Vintage Czechoslovakia Hand Decorated Large Perfume Atomizer! beautiful Jeweled Picture Frame with Glass Made by Apollo Studios in the 1920's No missing stones See pictures for tape measure CONDITION: VERY GOOD As with all of my items, this item is FINAL SALE, AS IS, and is NON-RETURNABLE, Shipping: I am happy to combine shipping when it is possible and practical. You can expect your package to arrive sound. I pride myself on carefully packing your investment. In many cases I double box for a safe trip. My US shipping rates are flat rates... they do include insurance, tracking and plenty of packing material. International shipping worldwide at a flat rate and includes insurance CANADA Residents: Your shipping rate is less than the flat international rate because of your location. If winner please contact me for actual cost or go ahead and pay ...then a refund will be made for the difference. The silver handle is decorated with rococo swirls to the sides and a scroll to the tip. Buy all five and ask for a better price.